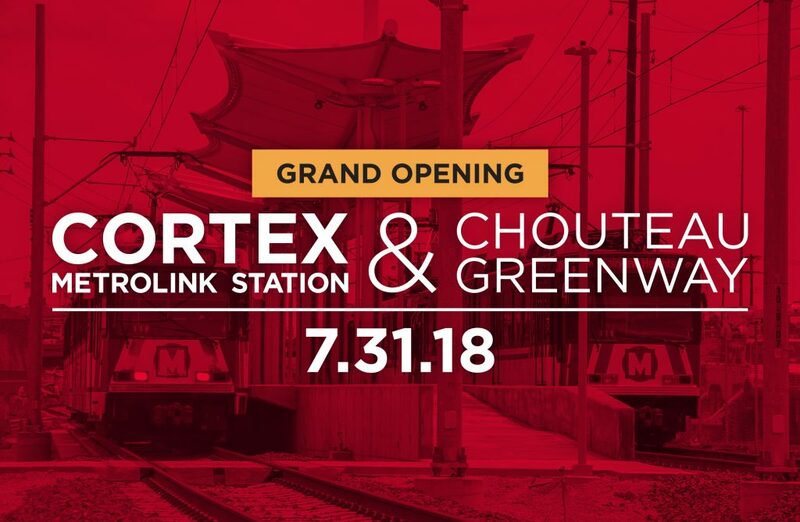 The opening of the Cortex MetroLink Station and the first quarter-mile section of the Chouteau Greenway will open in just a few days, and we’re inviting you to help us celebrate this special occasion. The dedication ceremony will kick off around 10 a.m. on Tuesday, July 31, at the Cortex Commons, located just north of the Cortex MetroLink Station at 4270 Duncan Ave. Be sure to get here early, as St. Louis Cardinals’ Fredbird and St. Louis Blues’ Louie will greet guests before the ceremony. After the official dedication and ribbon-cutting are complete, the celebration will continue into the afternoon in the Cortex Commons with food, music and festivities from 11 a.m. to 2 p.m. Enjoy music from Y98 and a live performance from St. Louis blues artist Sharon Foehner, presented by The Sheldon. You will also be able to grab a bite for lunch from one of four food trucks: Pi on the Spot, Cha Cha Chow, Slide Piece and Sarah’s Cake Shop. For those of you who are new to the Cortex Innovation Community and that area of the city of St. Louis, you’ll have a chance to meet with local businesses who will be at the celebration, including BJC WellAware Center, IKEA, 23 City Blocks, Park Avenue Coffee, YogaBuzz and more. We’ll also have the Gateway Info Bus available for those who want to sign up for the Gateway Go or Gateway Card. The Link Market, the Betty Jean Kerr People’s Health Centers Mobile Health Van and the Links 2 Health Mobile Screening Unit will also be part of the celebration. MetroLink will begin serving the Cortex MetroLink Station at the beginning of the day on Tuesday, July 31. We encourage everyone planning to celebrate with us to ride MetroLink to the Cortex Station to take part in the celebration. You’re also welcome to take advantage of the new greenway by bringing your bike on board as well. Construction of the region’s newest greenway, and the first MetroLink station to be built in more than a decade, began last summer. This is also the first MetroLink station to be constructed using public and private funding. The Cortex MetroLink Station – located between the Central West End and Grand MetroLink Stations – is the light rail system’s 38th MetroLink station and provides a new, convenient transportation option for the thousands of employees and visitors in the central corridor of St. Louis where parking is at a premium. The Cortex MetroLink Station and Chouteau Greenway project was made possible through a partnership between the Federal Transit Administration, Cortex, Washington University, BJC Healthcare, Great Rivers Greenway, the City of St. Louis, Citizens for Modern Transit, Metro Transit and Bi-State Development. Are there plans to bring the metro into Arnold? Frank, the city of Arnold is in Jefferson County. At this time, Jefferson County does not appropriate resources to support Metro Transit services. For Metro Transit to operate transit services in Jefferson County — and thus in the city of Arnold — a funding mechanism (such as a tax) would need to be approved by constituents of Jefferson County.